Business Wire: Ambarella introduces S2L, a family of Full HD camera SoCs for consumer, small business and professional IP-camera security applications. The S2L’s Smart-AVCTM H.264 low bitrate streaming technology reduces network bandwidth requirements, lowers cloud storage costs and supports the use of multiple cameras in home environments. Its flexible ARM Cortex-A9 CPU provides the performance required for intelligent video analytics such as intrusion detection, or audio analytics such as breaking glass detection. Additionally, the S2L dewarper can correct images captured from wide angle lenses to enable cameras that cover a wide viewing area. "The S2L family brings advanced professional features to mainstream and consumer IP cameras, including Full HD video, High Dynamic Range (HDR) image processing, advanced analytics and wide angle viewing," said Chris Day, VP of Marketing and Business Development at Ambarella. "Designed in an advanced 28nm process, S2L enables a new generation of intelligent, ultra-low power and small form factor IP cameras with outstanding video quality." The S2L family includes a series of software-compatible SoCs that range from 720p30 up to 1080p60 H.264 video and up to 5 MP resolution. The S2L chips feature multi-exposure HDR and Motion Compensated Temporal Filtering (MCTF) noise reduction. Power consumption for 1080p30 encoding is under 500mW including DRAM. 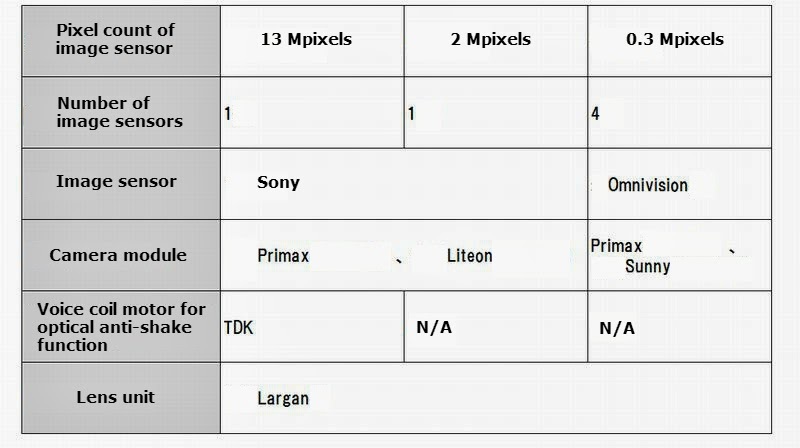 Regarding the Kodak image sensor-related patents mentioned in the presentation, most part of them was acquired by Omnivision. The advantages of such an approach are not clear to me, but it's a fresh idea and can work, if pixel is not too small and one can spare 10-20V to control the transfer gate Vtx. PR Newswire: AltaSens introduces its first commercially available 4K sensor: the AL41410C. The Super-35 size image sensor delivers 4K cinema frames in either 12-bit or 10-bit resolution at up to 72fps using 1.3W power. A 5.2-μm pixel pitch gives the AL41410C its high sensitivity, as well as low noise and extensive compatibility with the available optics usually reserved for leading DSLR cameras. "This sensor delivers crisp, high frame rate imaging through 4K and beyond," explained Lester Kozlowski, the company founder and CEO. Darren Paulson, VP of Business Development and Compliance, added, "The sensor's expansive programmability, including extremely fast frame rates at multiple optical formats, enables the next generation of broadcast through scientific, military and consumer digital cameras." PR Newswire: AltaSens also introduces 4K camera module for commercial sale: the 4K Pro RGB. The camera module is based on the new sensor and generates 4K through HD video at multiple optical formats and frame rates. The high-end module can be used for broadcast, movie and TV production, scientific instruments, medical imaging, and UAVs to record video and capture stills. PR Newswire: There is also a monochrome night vision 4K low-light camera module: the 4K Pro Night-Vision. 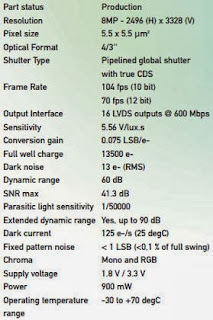 The intensified unit is the first commercially available low-light, ultra-high-resolution camera module. Its video engine generates multiple formats at high frame rates for resolute security, surveillance, life sciences, robotics, and astronomy applications. Applied Materials publishes a case study on how its team helps to improve image sensor process at LFoundry Avezano, Italy fab. One of the stories talks about excessive leakage current due to improper oxide spacer etch step. "The FabVantage team determined the root cause of the problem to be a recipe with low oxide-to-polysilicon sensitivity, which sometimes led to over-etching into the silicon substrate. Further complicating the matter, this overetching was not uniform across the tool’s chambers. Applied and the customer identified an optimized recipe as the best solution (see figure 1). It was also determined that the chamber lid temperature set point varied from chamber to chamber, which caused nonuniform etching across chambers. In addition, sensor trace analysis and Applied’s best known methods (BKMs) were used to optimize the etch process to eliminate voltage spikes that are known to lead to yield loss." A recipe with low oxide-to-polysilicon sensitivity sometimes led to over-etching into the silicon substrate (figure 1a left). A new recipe eliminated the problem (figure 1a right). 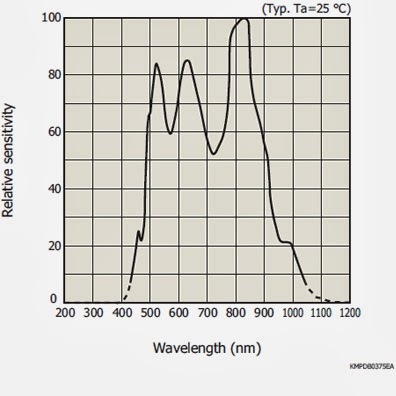 The graph compares the oxide-to-polysilicon sensitivity of several of Applied’s proposed recipe changes with the customer’s original recipe (figure 1b). Business Wire: Tessera signes a non-binding letter of intent (LOI) with Shenzhen, China O-Film Tech Co. for the sale of certain patents and equipment assets related to Tessera’s wholly-owned subsidiary DigitalOptics Corporation (“DOC”). 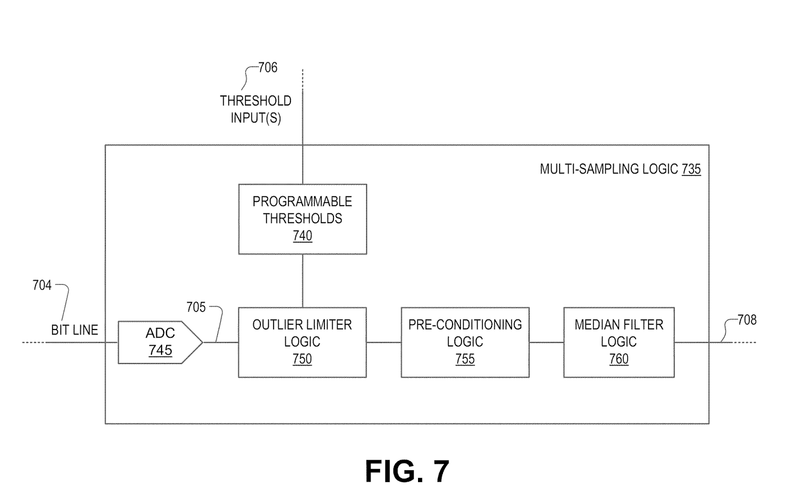 In addition, the LOI contemplates a patent license agreement related to MEMS and camera module technology, as well as a license agreement related to certain software features of Tessera’s FotoNation business. The LOI also contemplates that O-Film will assume or sublease DigitalOptics’ facility lease in Arcadia, California. Additionally, both Tessera and O-Film are working towards establishing a long-term collaborative relationship between the two companies. "This transaction with O-Film will enable us to continue to focus on our core competencies in IP licensing and imaging and we are pleased to have identified such a high-quality partner as O-Film for these valuable imaging assets," said Thomas Lacey, Tessera CEO. "O-Film is a leading developer of optical components and digital cameras in China. We are hopeful that a final agreement can be reached, and look forward to working with O-Film in the future." The total consideration for this transaction is $50M. O-Film made an initial deposit of $5M in connection with the signing of the LOI, which will be credited towards the total consideration. The balance of $45M is to be paid upon closing of the transaction. O-Film will pay the purchase price with its cash at hand. Thanks to SF for forwarding me the news! "to really understand what it is capable of, we need to know how the camera works. One basic point is that HTC One M8 camera is not like a Lytro camera, which simultaneously captures multiple points of focus. Instead, the actual photo taken in imaging terms is pretty conventional. The phone just knows where in the scene objects are so that it can manually blur everything but select items. It’s not really a case of re-focusing, but de-focusing." PR Newswire: Half a year ago, Dual Aperture has announced its partnership with Siliconfile (SK Hynix) to make a customized image sensor. Now the company announces its DSP partner - eWBM Co., to be designing a processing SoC to run Dual Aperture's image capture, refocusing, 3D image generation, depth estimation and gesture tracking algorithms. Dual Aperture's image sensor technology is based on 4-color sensor design. 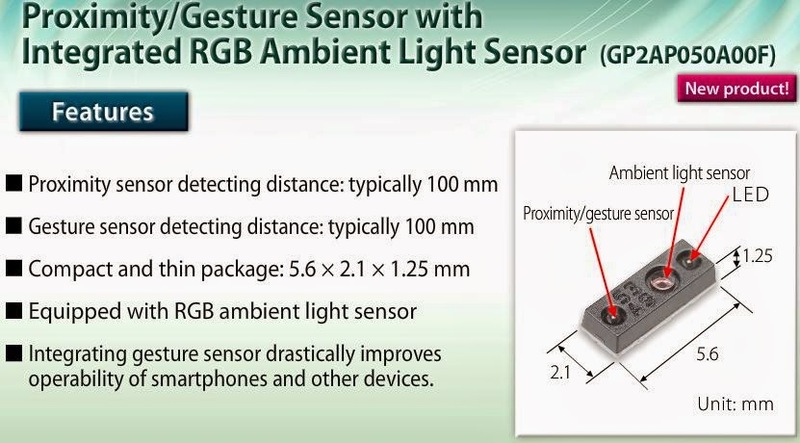 The 4-color sensor is comprised of RGB and IR pixels. 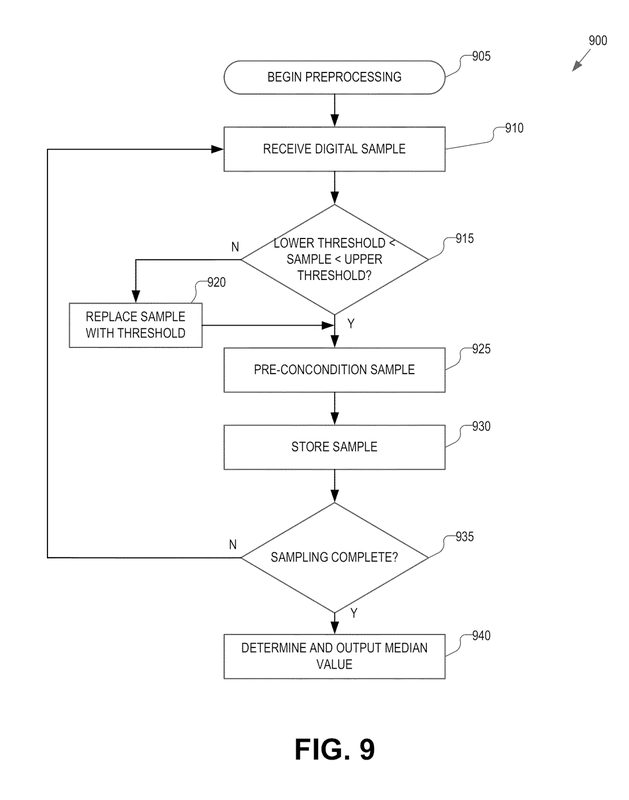 The sensor also uses separate apertures for RGB and IR pixels, thereby capturing data for two distinct images - one each in the RGB and the IR spectrums with varying sharpness, as shown in its patent application here. Q8. 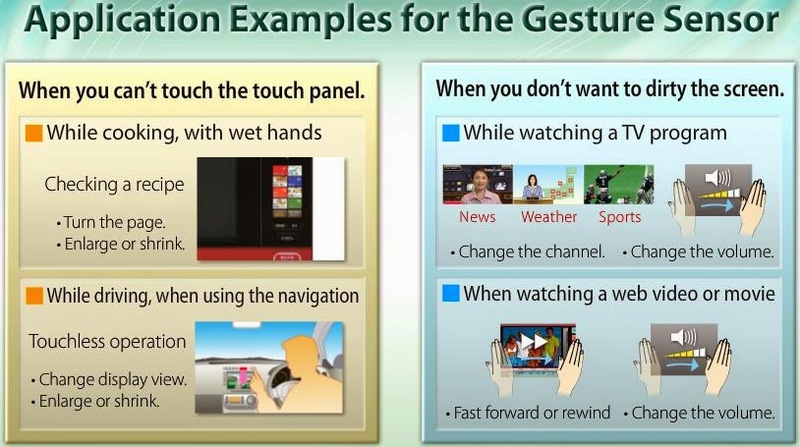 What are the advantages of DA approach vs. other gesture tracking devices like Kinect or Leap Motion? Kinect and Leap Motion systems require multiple sensors with elaborate LED lighting sources. 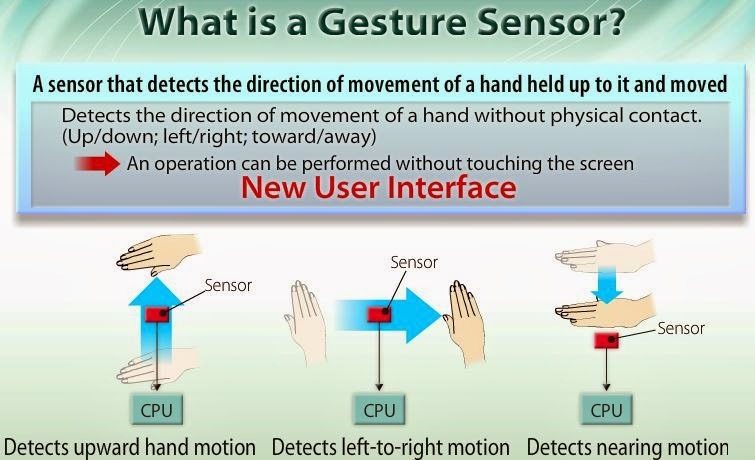 The Dual Aperture system requires only a single sensor using ambient light sources, which make it possible to implement gesture tracking in small form factor cameras, e.g. mobile device cameras. The DA system also works under direct, bright sunlight (unlike Kinect) and captures high quality color images (like conventional cameras). Q12. 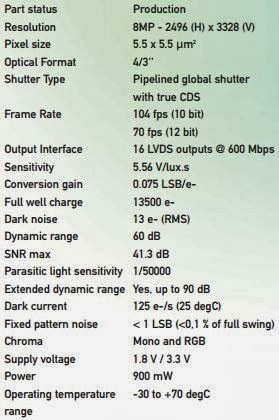 Are there any cost advantages or disadvantages compared to other similar multi-utility cameras? The Dual Aperture camera has lower manufacturing costs when compared to other similar depth measurement technologies that require additional sensors, special infrared light sources, and complex computing for image alignment. Q16. Is the DA sensor available? Yes. A 3.2M pixel mobile sensor sample is currently available. 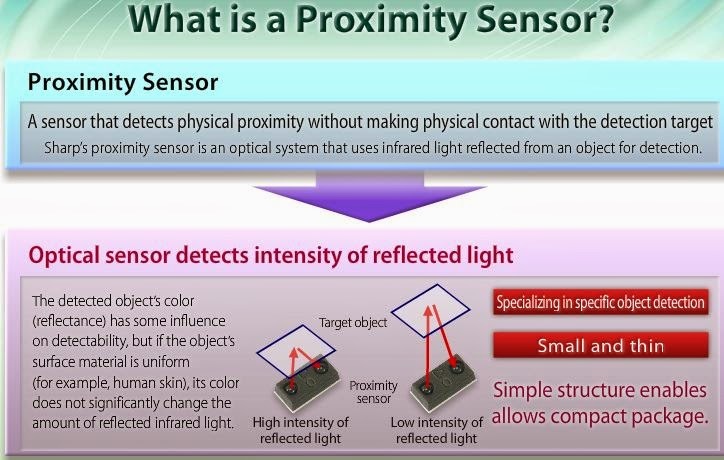 Other resolution sensors are currently under development and will be made available in 2014. Albert Theuwissen continues his MTF measurement series. The second part talks about the lens F-number affecting the sensor's MTF. Sony expects its sales of imaging sensor chips to jump 16 percent to 360 billion yen ($3.52 billion) in the year ending this month. "Some smartphone makers are upgrading their front-facing cameras for users who want sharper self-portraits, and that has opened up a whole new market for Sony," said Yutaka Okamoto, president of the company's device division. "Several fast-growing Chinese smartphone makers, keen to move upmarket, are also beginning to put in orders for Sony's high-spec chips. Sony has calculated that capacity at its existing factories would be unable to keep up with demand by mid-2015, even with a drop in demand for compact camera sensors." Macquarie Capital Securities director of research Damian Thong estimates the sensor business earns an operating margin of 10% to 15%. Sony says its global market share for smartphone image sensors is at 44 percent, mainly in the back-facing cameras used to snap photos. Sony's device business is increasingly tied to the smartphone market. Okamoto plays down worries that smartphone growth might peak out within the next few years, citing a number of other promising markets for image sensors. "Our hope is that wearables are next. We also expect to see increasing demand for sensors used in medical devices, autos, and in agriculture," he said. Sony faces a rising threat from Samsung Electronics. Samsung's newest flagship smartphone, the Galaxy S5, is due to be fitted with a Samsung's own image sensor, with Sony no longer the main supplier. "The fact that Samsung makes their own products on their own line with their own technology, that's a threat," Okamoto said. A group of engineers from Omnivision has founded Cista System Corp., based in San Jose, CA. The founding group is Zheng (Wilson) Du (former Module Development Manager at Omnivision), Jiangtao Pang (former director of Product Design at Omnivision), Guangbin Zhang (former Analog Design Manager at Omnivision). The new company has raised $5M in round A at the end of 2013 and joined MIPI Alliance with the adopter status. It's not clear what the new company is working on, but Guangbin Zhang's LinkedIn page says that he has "invented new sensor readout structure with 5 pending patents. More fundamental innovations are on the way." The measured AA simulator frequency is about 500Hz, meaning it's somewhat less effective for exposures shorter than 1/500s. Sharp has published videos on its imaging solutions and proximity sensors businesses, and also a datasheet and application note on triangulation-based distance measuring module. Tech-On quotes KGI Securities Investment Advisory (Taiwan) analyst Ming-Chi Kuo predicting that the long rumored Amazon's "smartphone will come with six camera modules, four of which will be used for gesture-based control and other user interfaces (UIs) that detect the user's motions. Kuo considers that the cost for procuring the camera modules is US$40-50 per phone." BGR partially confirms the story through its own sources. 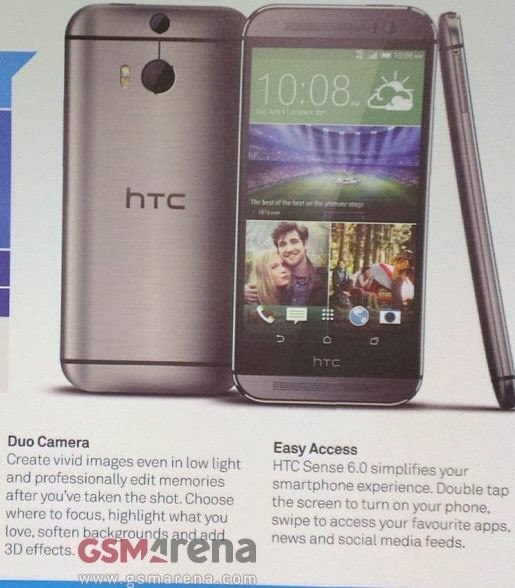 The phone is expected to be available in Q2 2014. In full pixel scan mode at 22fps with 12b A/D conversion, the sensor consumes 416mW, while in 1080p60 mode the power is 311mW. 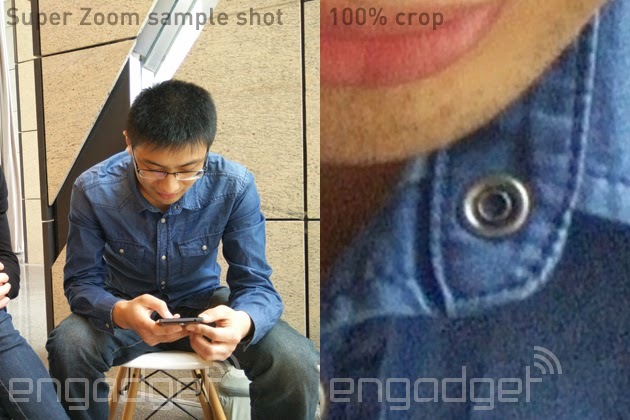 Although it's hard to tell for sure, but it looks like Oppo has licensed Almalence Super Zoom technology. 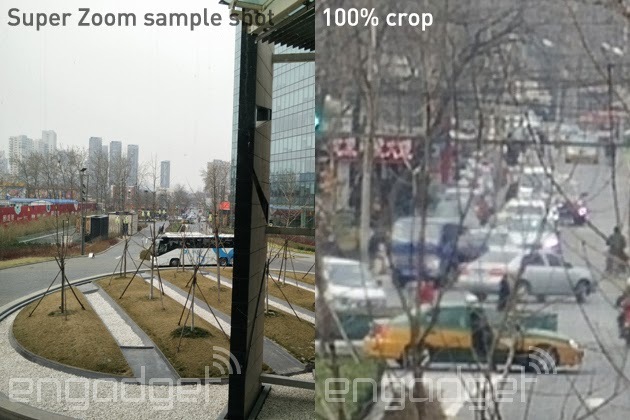 There is a comparison of Almalence Superresolution Zoom with Sony Clear Image Zoom and an article on its implementation in Huawei phones. 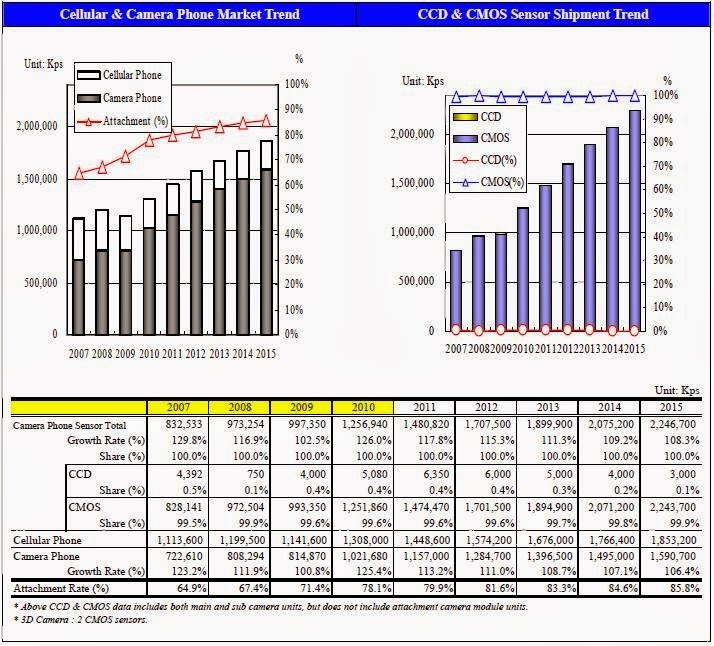 "Without taking DSC into account, CMOS camera modules generate the output value of about USD13 billion in 2013, up 28.7% from 2012. The output value is expected to hit USD15.9 billion in 2014, representing a year-on-year increase of 22.3%, mainly because of the adding of higher pixels and more complex features such as OIS." "Mid-size and luxury cars are sold well in China, which makes the automotive CCM market become the most potential market. For example, KIA's K9 uses five sets of CCM. The automotive CCM shipment totaled 24,946,000 sets in 2012 and will grow by 56.4% year on year to 39,008,000 sets in 2013. The shipment is expected to maintain rapid growth, reaching 59,632,000 sets with the increase of 52.9% in 2014. 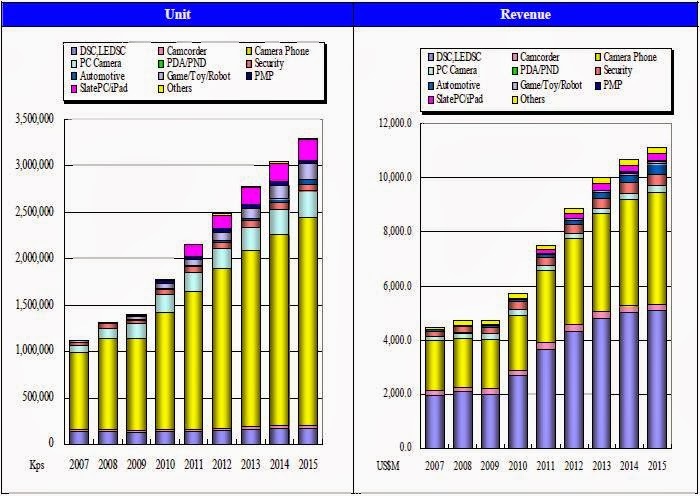 The automotive CCM market is dominated by Panasonic, Sony, Magna, Valeo, MCNEX, Gentex, Fujitsu, Continetal and Autoliv." "As for the lens field, Largan ranks first, far ahead of the second follower. 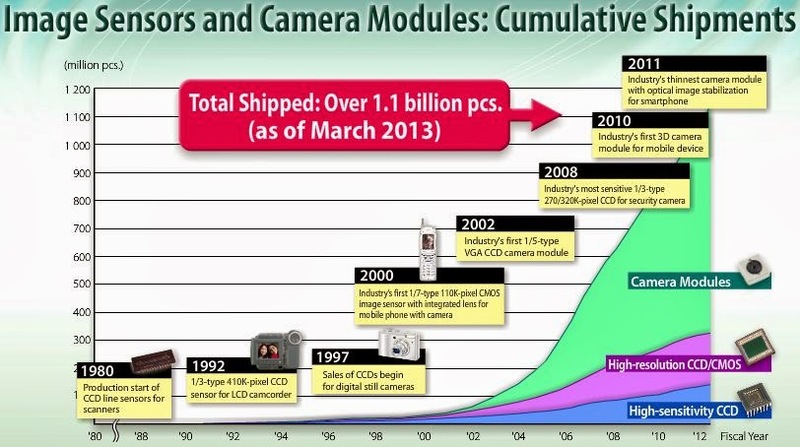 Largan almost monopolizes the beyond-8-megapixel lens market. Its gross margin and operating margin jump from 2012 and the revenue is approaching USD1 billion. The revenue of the second-ranked GSEO falls to less than USD350 million in 2013." Business Wire: TowerJazzand and Gpixel, a custom IC design house in China, announce the release of Gpixel’s world’s highest resolution CMOS image sensor using TowerJazz’s TS18IS technology. Gpixel’s 150MP GMAX3005 sensor targets medical, industrial and scientific markets. The new sensor from Gpixel and additional products expected to be released this year will answer the growing demand in China for high end image sensors. "We believe that an intelligent imaging system is essential for all future smart ICs. The core of such an imaging system is a high performance, robust, reliable and integrated image sensor. We chose TowerJazz’s CMOS image sensor manufacturing process due to its excellent pixel performance, stitching technology for wafer scale die size, and its outstanding pixel and process customization capabilities," said Dr. Xinyang Wang, Founder & CEO, Gpixel, "We believe China is on its way to become the biggest market in the world for high-end image sensor products and TowerJazz, as our strategic partner, is critical to our success." "We are pleased Gpixel is starting the production ramp of their high resolution image sensor and we are confident they will grow rapidly to address China’s rising demand in the high end CMOS image sensor market," said Dr. Avi Strum, VP and GM of TowerJazz CMOS Image Sensor Business Unit. "Gpixel’s GMAX3005 was a first time success due to Gpixel’s design engineers’ very high skills and knowledge of CIS design. We believe Gpixel is the most interesting and promising CIS company in China today." Gpixel’s GMAX3005 is a monochrome image sensor with 150MP 5.5um-sized active pixels, and is capable of running at 10fps at full resolution with higher frame rates achieved in row-windowing mode. This “wafer-scale” sensor has an 167.6mm x 30.1mm chip size including 165mm x 27.5mm photon-sensitive area having 30,000×5,000 pixel array. GMAX3005 has 16-bit on-chip ADC with 12-bit ENOB, and 120 LVDS output pairs running at 200Mbps. The sensor consumes less than 2.5W at full frame rate in full resolution. GMAX3005 reaches a noise level of less than 4e-, a dynamic range of 75.4dB, and over 70% quantum efficiency at 550nm wavelength. GMAX3005 has a dark current as low as 10e-/s/pixel at 32ºC, which makes long exposure possible even without active cooling. Gpixel Inc. is a Chinese company specialized in providing high-end customized and off-the-shelf CMOS image sensor solutions for industrial, medical, and scientific applications. 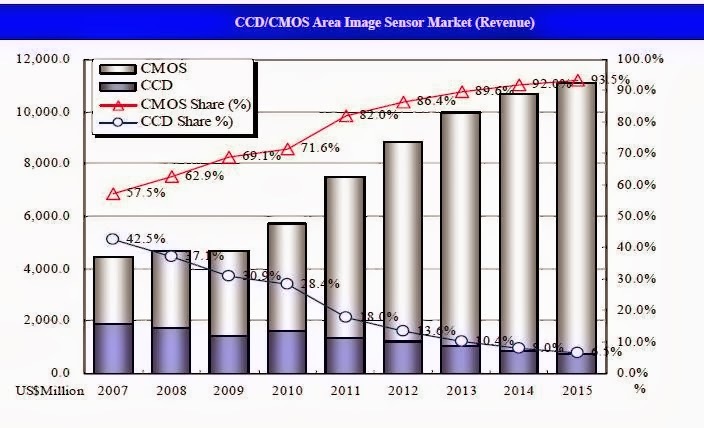 The company was founded in 2013 by experienced CMOS image sensor designers and semiconductor physicists. 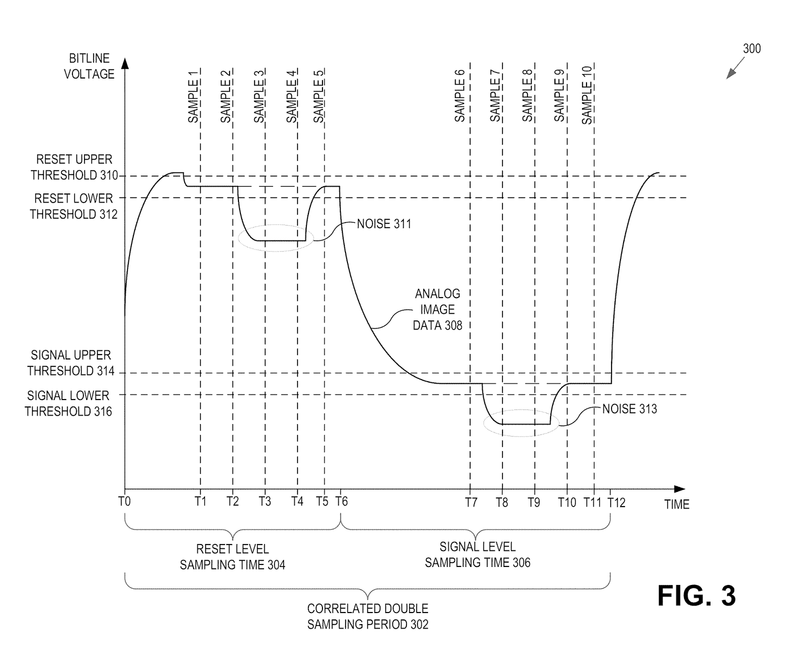 In less than two years, Gpixel has filed more than 10 patent applications, covering from global shutter pixel, HDR pixel, low power and high speed ADCs. Gpixel products focus on extremely high resolution (over 100MP), very low noise (<2e-), high DR (>100dB) and ultra-high speed (>2Gpix/s) image sensor applications. Update: According to LinkedIn records, Gpixel Founder and CEO Xinyang Wang is also a professor at Chinese Academy of Science. He used to work on image sensor design for On Semi and CMOSIS in Belgium from 2008 to 2012. 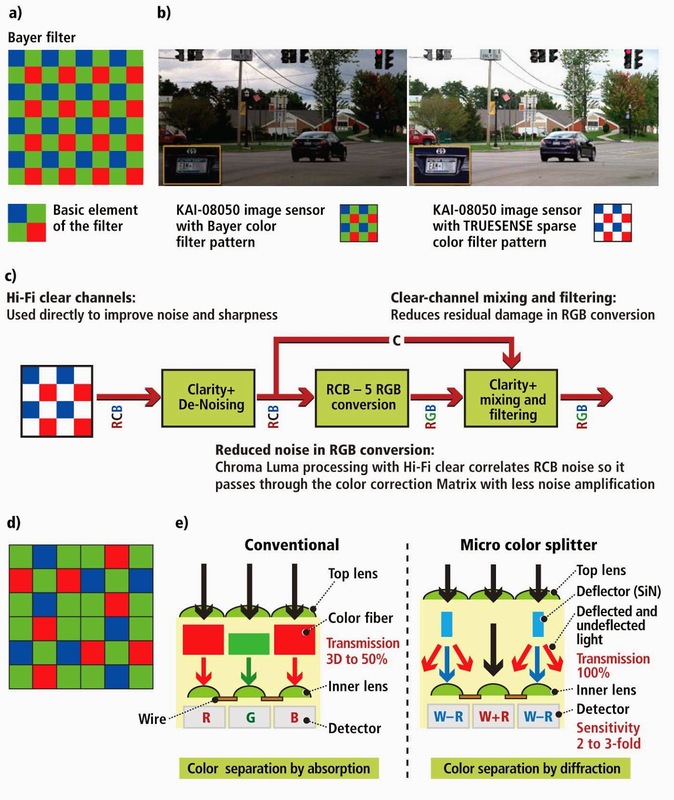 (e) Panasonic proposes a method that replaces these color filters with inorganic color splitters. "Project Tango "is a 5” phone containing customized hardware and software designed to track the full 3D motion of the device, while simultaneously creating a map of the environment." - a depth camera 320x180@5Hz. - a front camera with a 120 degree FOV (similar to the human eye FOV)." Nokia Conversations blog reports that Nokia Lytro and Pelican-like Refocus application, initially available only for Lumia PureView smartphone, now can be installed on any of Lumia Windows Phone 8 smartphones. DPReview, AppleInsider noticed that "the number of open positions in Apple's camera engineering group has risen dramatically in recent weeks. Apple advertised 9 openings in February and has added at least 15 more just 12 days into March, with a majority located at the company's Cupertino, Calif. corporate headquarters." "Our competitive advantage is in process technology and design company specializing in Fabless despite mass production to the highest quality and support. Commercialization of the technology we hold Shared Pixel technology is designed as a manufacturer of domestic design development completed in 2006 and was the first mass-produced in 2007, succeeded. Shared Pixel Pixel in units of some of the elements that are common to multiple Pixel to the common use of the remaining area and optical efficiency can increase as the technology used to place the device, this structure enables Pixel unit between the physical / electrical symmetry Pixel differences between the characteristics of the two broken occur Sensor Chip, which results in a performance drop to their unique company specializing in the design process that does not use technology that is difficult to introduce. Our flagship product is a 300,000 up to 2 million pixels CMOS products (VGA level) and the Taiwan handset market direction of mainly low-cost laptops to be targeting a Web Cam. The increase in demand for high-resolution product compared megapixel technology to ensure the design of the product and the roadmap to gradually expand the high-resolution product available. In addition to excellent image quality in order to meet customer demands for HD (High Definition) video HD Pixel structure which can cope with the successful development of the mass production, and applied to smart phones as a camera sensor for a non-conventional manner parallel Interface , Serial (MIPI) Interface type of product development. further, the image sensor is not normal for taking additional special features, such as image sensors and special purpose planning to develop high value-added products." American Association of Physicists in Medicine published a video lecture on photon-counting detectors in dual energy CT imaging and image quality on clinical CT applications. No embedding is allowed, one can watch it only on Vimeo site. PR Newswire: Frost & Sullivan Strategic Analysis of the World Optical and Image Sensors Market, finds that the market earned revenues of $9.07 billion in 2013 and estimates this to reach $15.12 billion in 2019. "Maintaining a balance between high image quality, technology and price is the biggest challenge for optical and image sensor suppliers. This is compounded by the large number of established and emerging participants, especially in the consumer electronics segment that have intensified competition and pricing pressures. Since smaller manufacturers find it difficult to differentiate products by any factor other than price, their entry into high-volume application markets will be tough. 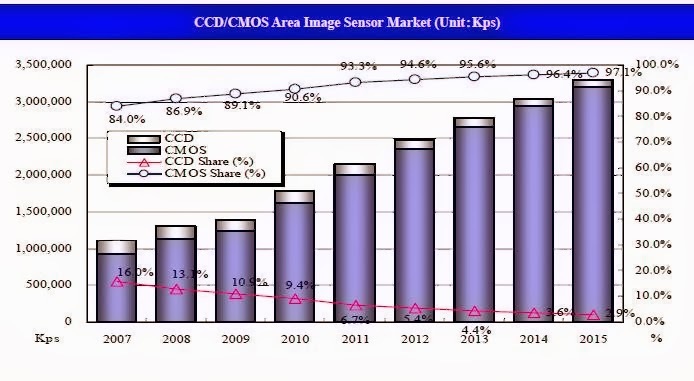 Another barrier for entrants is the strong brand image and customer loyalty that established competitors have built in the image sensors market. Smaller manufacturers need to enhance their product development and target niche areas (low volume but high margin) to contend with large companies." Business Wire: Dongbu HiTek confirmes that it is volume manufacturing "X3 Quattro" direct image sensors for Foveon for its parent company Sigma. 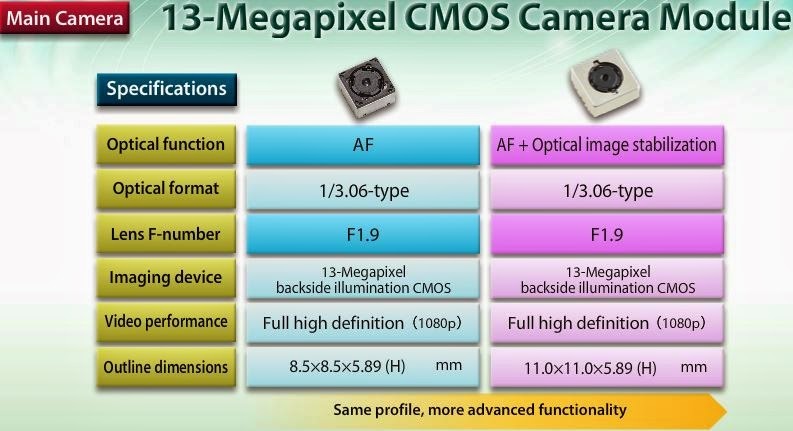 "Foveon’s newly developed X3 Quattro sensors can deliver 39 megapixel-equivalent ultrahigh resolution to enable stunning image quality" said Jae Song, Dongbu HiTek EVP of marketing. "Compared to prior sensor designs, this represents a 30% increase in pixel detail without the need to increase chip size. We take great pride in being the only foundry capable of processing and manufacturing Foveon’s specialized sensors using a pixel-stacking architecture.” He noted that Dongbu HiTek has been processing and manufacturing innovative CIS devices for Foveon for over a decade, and that the latest 39 megapixel-equivalent sensor has been in production for more than nine months." CMOSIS announces the CMV8000, a 4/3-inch 8MP sensor based on 5.5µm 8T glogal shutter pixel architecture. From an electro-optical point-of-view the CMV8000 offers the same performance as the older CMV2000 and CMV4000 sensors. "With the introduction of the CMV8000 we respond to the requests of many of our customer for a sensor with CMV performance closing the resolution gap that existed between our CMV4000 and CMV12000 image sensors", said Lou Hermans, COO, CMOSIS. "The full frame rate of 104 frames per second is achieved by using the proven data interfacing of the recently launched CMV12000."